Then the moment of epiphany happened. I realized that the common theme across all the three was the ‘absence’ of something. The absence of words to teach the truth, the absence of sound to highlight the music in the everyday sounds, the absence of material to highlight the beauty of space. In this post, I start with verse from Dakshinamoorthy stotram, and the influence it had in my understanding of John Cage’s 4.33, Fred Sandbacks string sculptures and how this in turn has lead to my germinating two creative ideas. The very first verse of Dakshinamoorthy stotram (Composed by Adi Shankracharya) avers in a very profound manner that the ultimate reality (Brahman) is beyond words. Here is the verse in Sanskrit, followed by English along with the meaning and commentary. The concept of teaching in silence struck a chord with me and made me reflect on it several times in the recent times. There was something in that verse, that made me go back to it time and again and reflect over its beauty. Sometime last year, I was introduced to John Cage’s famous piece 4.33 by Dr Raja Angara, a renowned Sitar player from Hyderabad. Here is the video of a performance. When I first heard ( or did not hear the piece), I was intrigued with the concept of a Western classical musician performing a silent piece, and researched further on the idea behind this performance. ( Acknowledged as a path-breaking and seminal piece, there is plenty of information/commentary available on the net) . in the nick of time, Gita Sarabhai came from India. she gave me the Gospel of Sri Ramakrishna. Suffice it to say, the intention behind 4.33 was to quieten the mind and render it susceptible to normal sounds, which he felt could also be construed as music. 4.33 was composed by him in 1952. Watch this video by him. Watching and reading about the piece, I felt connected with John Cage and admired him for his audacity and courage of his conviction to not just ‘write’ a piece like 4.33 but to actually ensure that it was performed with such sincerity and integrity. Remember this was in 1952. I can understand the rebel 70’s to accept such kind of bold departure, but early 50s? How much time would he have had to spend convincing the producers about the uniqueness of such a silent piece, which when heard or not heard can potentially invoke ridicule amongst a conservative audience? Some time last fall, on my way back to the visit to Storm King, I visited Dia Beacon. 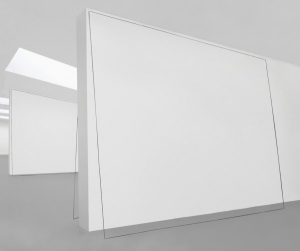 For any contemporary art lover, Dia is a veritable treasure house of works by giants. As I was walking through the gallery absorbing the pieces, I discovered the sculptures by Fred Sandback. Having visited a number of sculpture parks and shows around the world, I am used to experiencing the “aha” moment, but Sandback was, to use a corny phrase ‘the mother of all ‘aha’ moments! 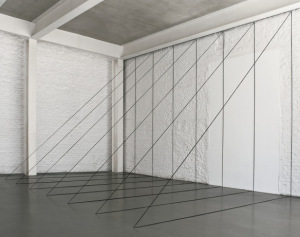 Using something a material as simple as string, Sandback created sculptures that seem to envelope space, giving it a boundary, a border, while simultaneously leaving it open for us to imagine, what that enclosed space could contain. Or you could just see the whole gallery as a sculpture in which strings have been strung in a beautiful pattern, so in a sense the enclosure of the art ‘space” is the walls of the gallery inter spread with strings. So you could experience both the outside as well as the inside of a space. More information on his works can be found at here and here. 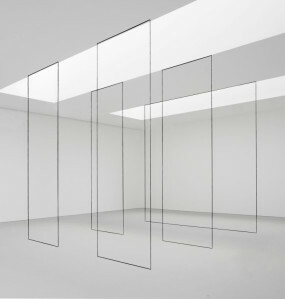 I initially reacted to each of his piece individually and kept imagining, what material, what object, what color, would do justice to the space being enclosed by the strings. It was an exercise in ‘collecting everything” and putting it back in the space, what the artist has so beautifully “gotten rid off’! I was trying to inject material into the space created by the artist, even though it was not the intent of the artist! It was in this process, I realized that the beauty in his sculptures was in the absence of the material. The simplicity with which the fragile strings convey this was deeply profound and had a lasting impact on me. Dia has so many great artists works Serra, Judd, Kawara, Warhol to name a few. Its always difficult to judge one against the other, but Sandback’s work took on a spiritual dimension that resonated very strongly with me and my vedantic background. In all these months, I kept revisiting the first verse of the Dakshinamurthi stotram. There was something in “teaching through silence” that stayed with me and kept haunting me time and again. There was some understanding, some insight that was waiting to be discovered. I also kept thinking about Sandback’s works as well as John Cage’s 4.33. I could see there was some connection to be made between the three concepts that were periodically intriguing and engaging my mind. Then the moment of epiphany happened. I realized that the common theme across all the three was the ‘absence’ of something. The absence of words to teach the truth, the absence of sound to highlight the music in the everyday sounds, the absence of material to highlight the beauty of space, (that we so seem to take for granted). Parallely, my own inner struggle to express myself creatively began manifesting itself more intensely. I began exploring the concept of ‘absence’ a bit more deeply and tried to take it to other fields of art. b) Man is poisoned to be killed, but instead goes temporarily blind. He escapes from his killers and races against time to find an antidote else he will be permanently blinded and killed if the attackers find him. It’s a movie that is a race against time and narrative would be his inner dialogues’, his talking to strangers, familiar sounds and score. Whenever he is talking to strangers, there would be a brief visual of his current location to give a perspective to the audience on his whereabouts. c) Set in Peru or Cambodia ( for the fans of Jolie) explorer falls into a maze of caves, which have been so structured in the ancient times that the sunlight is visible for five minutes every day when the sunlight passes a particular point. The rest of the day he lives in darkness and has to find himself out of the place. The above are three simple ideas, but more ideas can be thought off along these lines. With absence of visuals, the movie will force you to visualize the story through sounds. Imagine a yoga studio. People lying in ‘savasana” or sitting in a meditative posture. The instructor is seated facing the audience. The instructor in this case is not a yoga guru, but an artist. For the next 30 minutes he will describe his art (painting or a sculpture or an installation). The level of description is completely left to him. He can be vivid and detailed or vague and cryptic. The methodology too would be unique to him following no set pattern or routine.Once he completes his description he can discuss his art with his audience or simply leave, leaving no trace of his art except in the memories of the audience. Just words describing his work. The description by the artist and the visualization by the members in the audience will be unique to each one of them. No two members will have the same reaction or the same visualization to the description by the artist. The above are two of my ideas that had their basis from my understanding of the value of absence. Each one of us can reflect on the value of absence and explore it further in our own unique way. To paraphrase Gita Sarabhai, absence helps you quieten your mind and open itself to creative influences, because for me in creativity there is divinity.